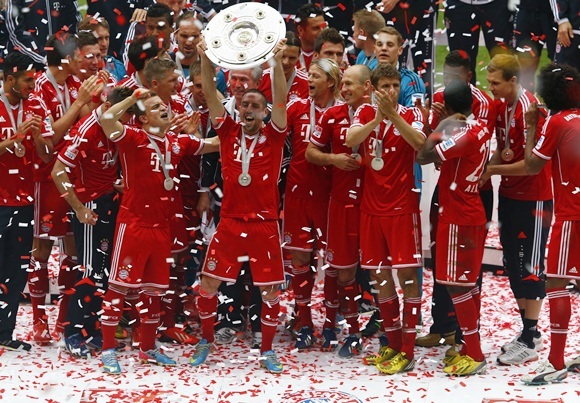 Champions Bayern Munich lifted their 22nd Bundesliga trophy on Saturday after a comfortable 3-0 over Augsburg as they prepare for the all-German Champions League final against Borussia Dortmund in two weeks. In front of German footbal chiefs, two dozen former Bayern greats and Bavarian political royalty, the champions left it late, scoring three goals in the second half through Thomas Mueller, Xherdan Shaqiri and Luiz Gustavo. 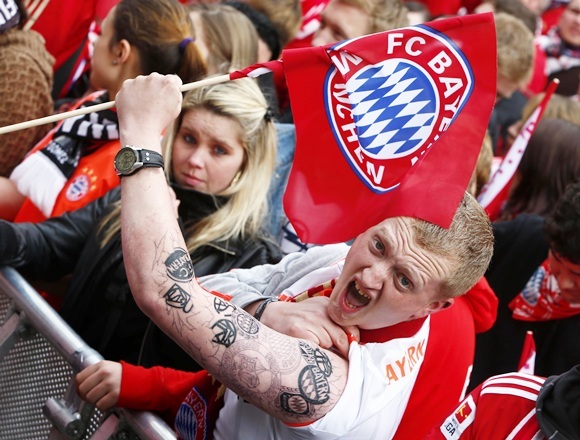 It was a 28th win in 33 league games, with one match left in the season, for sensational Bayern who weeks ago secured their 23rd German league title and 22nd since the introduction of the Bundesliga half a century ago. Augsburg's Alexander Manninger made two sensational first- half saves to deny Mueller and Mario Mandzukic from point-blank range and the battling visitors even hit the bar early in the second half. But Austrian Manninger was well beaten when Brazil international Dante floated a long cross into the box and Mueller rose high at the far post to head in. Franck Ribery took on four Augsburg players and threaded the ball to Shaqiri who turned and scored in the 81st before Brazilian Gustavo completed the win with a low drive three minutes from time. Dortmund were far less convincing, needing two late goals from Marco Reus to escape with a 3-3 draw at VfL Wolfsburg. Former Dortmund striker Ivan Perisic struck twice in the first half against his former team before Naldo drilled in from close range to complete a three-goal 12-minute spell after Sven Bender had put Dortmund ahead. Freiburg kept their slim Champions League chances alive when Max Kruse scored a 78th-minute winner to edge 2-1 past relegated Greuther Fuerth, who become the first Bundesliga team not to win a home game in a season. Sweden's Branimir Hrgota scored a hat-trick to steer Borussia Moenchenglabdach to a 4-2 victory over Mainz 05 and maintain their hopes of clinching a Europa League spot next season. At the other end of the table, Hoffenheim's chances of staying up all but vanished with a 4-1 demolition by visiting Hamburg SV. Hoffenheim, in 17th place on 28 points, two behind Augsburg who are on the relegation playoff spot in 16th, need to win at Dortmund next week.